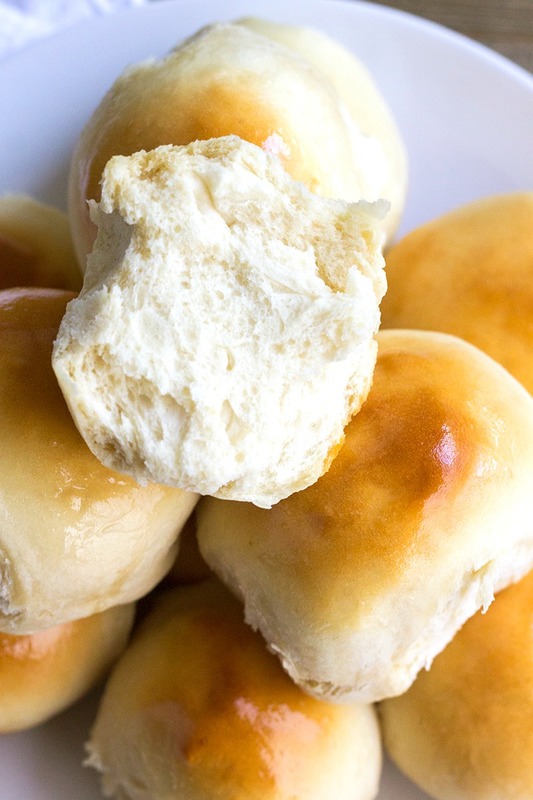 These slightly sweet and oh so fluffy 40-Minute Milk and Honey Dinner Rolls are perfect for weeknights or holiday dinners. So easy to make, they’re a must-have recipe for any home cook! Bread is my ultimate comfort food love language. It takes a little time and some love, but a great bread recipe is one of those wonderful things I’ve always treasured. So it might come as a total shock that I’ve never actually made dinner rolls from scratch until now. Growing up my step-dad always made rolls. He has a family recipe and I wasn’t chomping at the bit to make my own if someone was making them for me. Now that I’ve made this 40-Minute Milk and Honey Dinner Roll recipe I can’t believe I never bothered to do this sooner! Making rolls are right up there with making pie crust for me now. Total food prep therapy. It’s no surprise I love food blogs. I mean I have one so I should, but way back before I ever started my own site, I was reading food blogs and looking for awesome recipe ideas. The Slow Roasted Italian was one of the first food blogs I really got into all those years ago. So of course when I got the opportunity to review Donna & Chad’s new cookbook, The Simple Kitchen, I jumped at the chance! 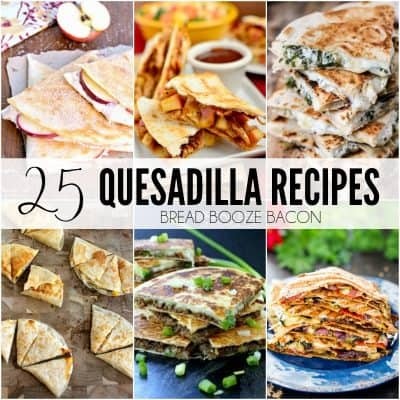 Let me tell you, I have a slew of recipes I’ve already bookmarked to make. 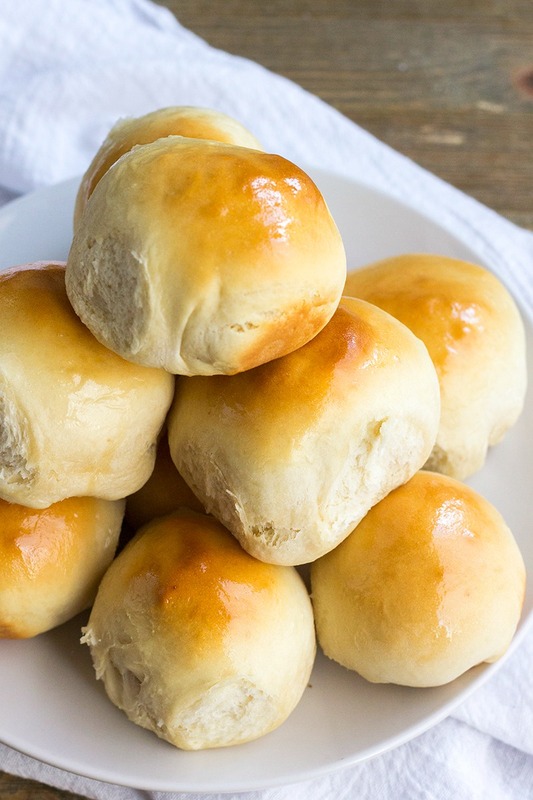 If these rolls are this easy to make, I can only imagine everything else is too. 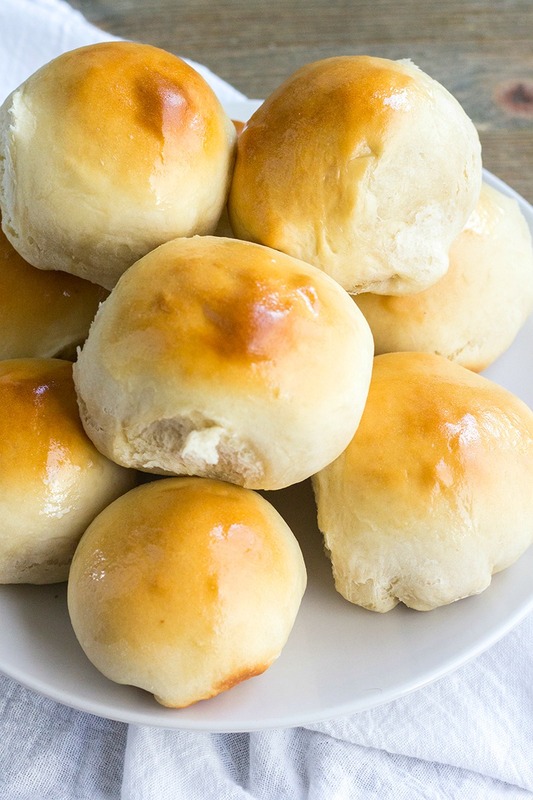 Donna & Chad’s recipes are pure comfort food and these rolls are no exception. While I was expecting a sweet taste from the honey, it was really subtle. Not in your face or anything. This rolls themselves are fluffy but toothsome and everyone at my house raved about them. I’m already to planning to make some for our big family Thanksgiving dinner next week. One of my favorite things about this recipe is that it can be made ahead of time. Prep the dough to the point of baking and through it in the fridge. You can refrigerate them overnight or make everything in the morning and bake at dinner time. So easy and SOOOOO delicious! I may have burned my mouth eating the first one. I just couldn’t wait. Make the rolls, slather some butter on them, and you’ll be in bread even. Promise! 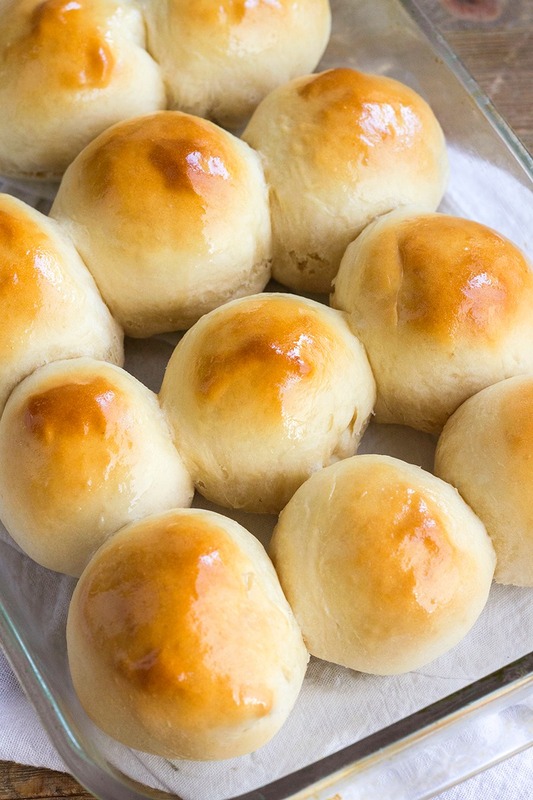 These slightly sweet and oh so fluffy 40-Minute Milk and Honey Dinner Rolls are perfect for weeknights or holiday dinners. So easy to make, they're a must-have recipe for any home cook! Preheat your oven to 350 degrees F. Brush a 9-inch x 13-inch baking dish with 1 tablespoon of melted butter. Set the dish on top of the stove to keep the butter warm. To the bowl of a stand mixer fitted with the dough hook attachment, add the yeast, milk, and honey. Stir the ingredients a little to mix them up and help dissolve the yeast. Let sit for 3 minutes to allow yeast to bloom (it'll get foamy and smell like yeast). Add 3 tablespoons melted butter and 3 1/2 cups flour to the mixer bowl. Stir on low with the mixer until smooth. If needed, add up to 1/2 cup of the remaining flour to form a soft dough. (I didn't need any extra flour, but Donna usually uses between 1/4 cup and 1/2 cup more flour.) Mix to combine. Transfer the dough to a lightly floured work surface. Roll the dough into a ball. Divide the ball into 12 even pieces (just do the best you can eyeballing it). Form each piece of dough into a roll by pinching the sides together in the middle until the outer edge is round. Then, turn the roll over. The top should be smooth. Set aside and repeat with the remaining dough. Place the rolls in your prepared baking dish pinched side down. It's okay if they touch just don't pack them in too tightly. Bake for 15 to 17 minutes or until the rolls are golden brown on top. If the tops begin to brown too quickly cover the rolls loosely with tin foil. Carefully remove the rolls from the oven and brush with the remaining 1 tablespoon of melted butter. Serve immediately or at room temperature. Store in an airtight container. You can make these rolls the night before! Prepare the recipe as written. Once the rolls are in the pan, cover them with plastic wrap and refrigerate. In the morning, take off the plastic wrap, and bake them in a preheated oven for 17 to 20 minutes until golden brown on top and cooked through. If you don't have a stand mixer, add the yeast, milk, and honey to mixing bowl. Let the yeast bloom. Add in 3 tablespoons of butter, flour, and salt. Stir with a wooden spoon until you can't stir anymore. Transfer the dough to a floured surface and knead for 3 to 5 minutes. Proceed to finish the rolls as directed. What an excellent recipe. Have been trying multiple dinner roll recipes and this is definitely the best so far. Simple and quick. Made them to serve crockpot pulled pork on. Delicious. Thanks for sharing. I’m so glad you enjoyed them Sue! They’re a favorite at my house too! Hi Louise! I haven’t tried freezing the rolls, but I would say you can freeze the dough once it’s in the pan and ready to bake. Then defrost in the fridge before baking later.